Slowly it is becoming more of a standard to sing the Lamentations of the Theotokos and set up an Epitaphios with a copy of her body similar to that of the entombed Jesus on Great and Holy Saturday in parishes both within and outside of Greece for the feast of the Dormition on August 15th. Below are some historical notes regarding this tradition. 1) The Lamentations of the Theotokos, like those for Christ on Great and Holy Saturday, are chanted after the 7th Ode before the Exaposteilaria the evening before the feast of the Dormition. This is the proper rule regarding the implementation of these hymns according to Metropolitan Dionysios of Old Patras who wrote these hymns in 1541 when he was at Girokomeio Monastery in Patras. He says further that they are not to be chanted by just anyone or any church, as is often the case today. 2) The Lamentations are not part of the liturgical rule for the feast of the Dormition. They were probably chanted originally at the tomb of the Panagia in Jerusalem. When these hymns began to spread outside of Jerusalem, they were only implemented by shrines which had a special veneration for the Virgin Mary. It seems from Jerusalem the Lamentations spread to the Dodecanese, especially Patmos, and only in the past 25 years or so did they become popular in Greece, and more recently in Greek parishes in the diaspora. One should take seriously the fact, however, that the Lamentations are not chanted neither on Mount Athos nor at the Ecumenical Patriarchate. 3. It was never part of tradition to have a "body" of the Virgin Mary processed in an Epitaphios as it is done with Christ. 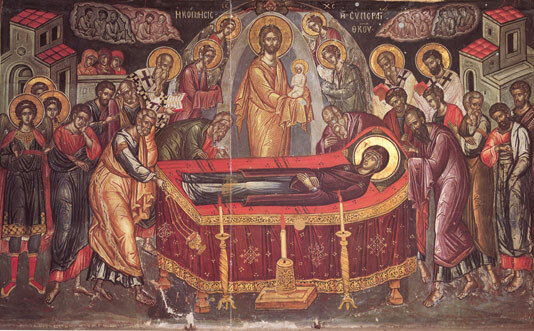 Dionysios specifically writes in 1541 that the "depiction on the analogion should be the holy icon of the Dormition of the Theotokos." The "body" it seems then is an innovation of recent times together with the procession of the Epitaphios, and should thus not be regarded as part of the tradition. 4. Unfortunately no detailed study exists how the Lamentations were conducted in Jerusalem originally. It is of great interest however that the Lamentations of Christ for Great and Holy Saturday date to the 15th century while those of the Theotokos date to the 16th century. With Patras being under the Ecumenical Patriarchate at the time, as well as all of Greece, it still never adopted the practice of chanting the Lamentations of the Theotokos. In fact, there is no record of the Lamentations being chanted at Girokomeio Monastery in Patras until 1997 when implemented at the all-night vigil for the feast of the Dormition by Metropolitan Nikodemos of Patras. There is much yet to be researched on this subject.